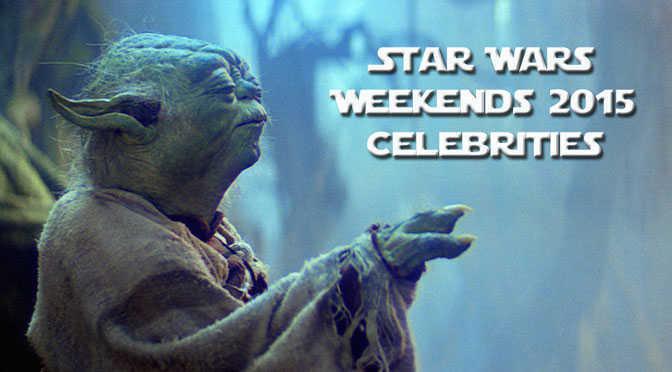 Disney Parks officially released the list of celebrities that will appear for Star Wars Weeeknds 2015. There are two new celebrities that are sure to stir some interest! Ian McDiarmid is famous among Star Wars fans for his portrayal of Senator and Emperor Palpatine series. Ian will appear Weekend One. Frank Oz is the other big celebrity to appear for the 2015 Weekends. He is the performer for none other than Yoda himself! He is scheduled to appear Weekend 5. Other popular returning celebrities include Peter Mayhew (Chewbacca), Warwick Davis (Wicket), Jeremy Bullock (Boba Fett) and fan favorite Ray Park (Darth Maul). All this, plus dozens of Star Wars characters appearing throughout the park, yummy Star Wars-inspired treats and the spectacular fireworks finale, “Symphony in the Stars.” It just goes to show you that Star Wars Weekends is as close to the Force as you can get! Additional Details on entertainment: The major shows that take place during Star Wars Weekends will be hosted at the Theater of the Stars (Beauty and the Beast). This will cause Beauty and the Beast to only be offered in the early morning and Star Wars shows in the afternoon. The Fastpass+ option for shows should return. The only downside for this venue is it is often closed during times of thunderstorms, so that could affect the entertainment during your date of visit. Listen closely as stars from Star Wars Rebels reveal the fascinating art of voice acting, as utilized throughout the Star Wars saga and beyond. Feel the force flowing as James Arnold Taylor fromStar Wars: The Clone Wars takes his audience on a fun and fascinating journey into the world of voice acting. Don’t miss this Star Wars Weekends exclusive as James performs over 200 popular and iconic characters! Who are YOU excited to meet this year? we will be there on May 15th. We have a 4 yr. old and a 2 yr.old. Would you say it is worth it to go to the show at Theater of Stars or better to just wander around with them?